Hello everyone, Ophelia here and welcome to another Artist Gang Tuesday video. 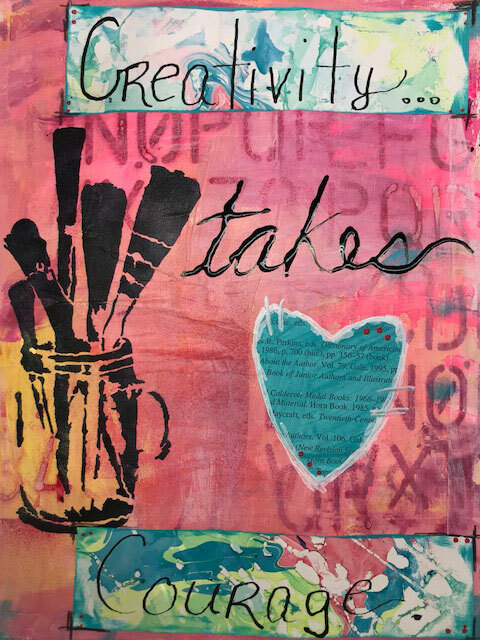 Today, I am working in my art journal with one of my favorite Donna Downey stencils of all time!! 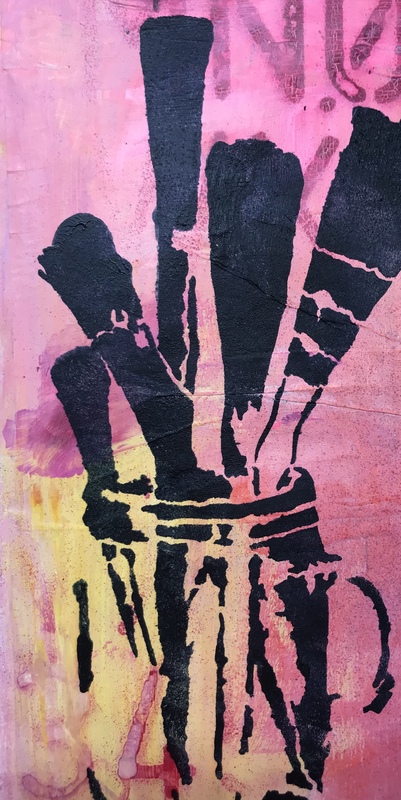 This is the Brushes in a Jar stencil, and I am in love with its boldness! I am keeping my journal page pretty simple as I want this beauty to be the star of the show. I just love how this stencil is do detailed and almost commands attention on a page. I find that since it is so bold, I can use it with very little work to create a stunning page! I started 2018 with a goal of being a bit more experimental, or fearless in my artwork, and I am finding that this idea of fearlessness takes a whole lot of courage. I wanted to create a page using this stencil as a gentle reminder that it does take courage. Any of your favorite acrylic paints for this page, I am using Lukas Cryl Studio. 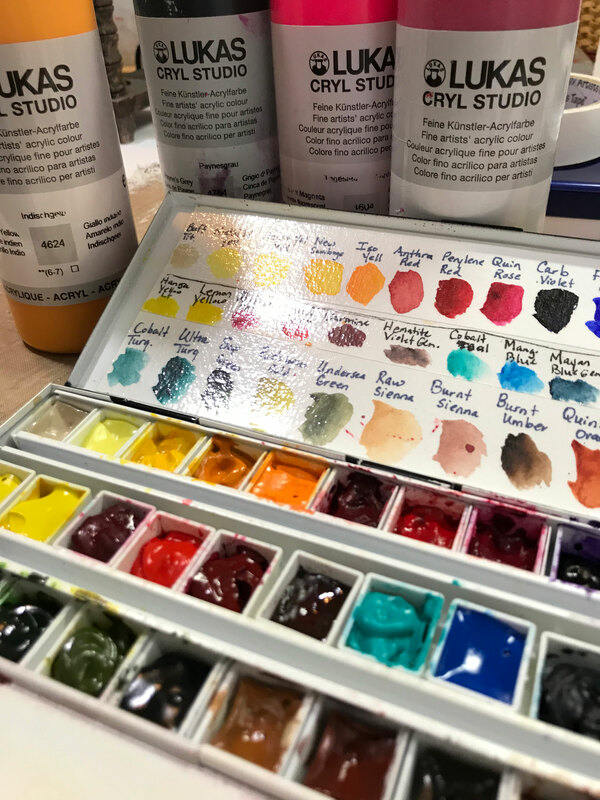 Daniel Smith Watercolors - in coordinating colors to your acrylic paints. This page was pretty simple to create, yet I feel that the stencil makes such a bold statement. Ophelia is a mixed media artist living in Creedmoor, NC. She is married with two children. Her son Stephen, is a freshman at Western New England University in Springfield, Mass, and her daughter Madison keeps everyone busy with a flurry of activities. Ophelia truly finds refuge and solace in her studio every single morning way before the day gets busy, she is there, simply playing in paint. After teaching middle school history for 15 years, she began her dream job as a high school visual arts teacher in August of 2017. She is the demo artist for her local Jerrysartarama in Raleigh where she is fortunate enough to be able to share her passion and inspires others to play. Ophelia absolutely adores playing in her journals or creating abstract paintings with lots of color and loads of marks. Her work is displayed at Ollies downtown Wake Forest and 311 Studios and Gallery downtown Raleigh, NC.